5 Tips for a Healthy Marriage… with a Baby! Here are just a few things we’ve learned since having a baby. We’ve only been married a handful of years, but so far these have really filled our cup! I have always heard “date your spouse.” This can sometimes be hard with a baby or multiple kids in the house! A night out for dinner is always lovely, but let’s face it – sometimes it isn’t in the budget or the schedule (especially if you have a sleeping babe). Well you are in luck! You don’t need to leave your house to spend quality time together! We’ve been known to make our backyard an Italian restaurant with a picnic blanket and pesto grilled fish, or our living room a movie theatre with popcorn and M&Ms. We even recently baked chocolate chip cookies together in the kitchen at 9PM. We truly caught up with one another over our kitchen island. 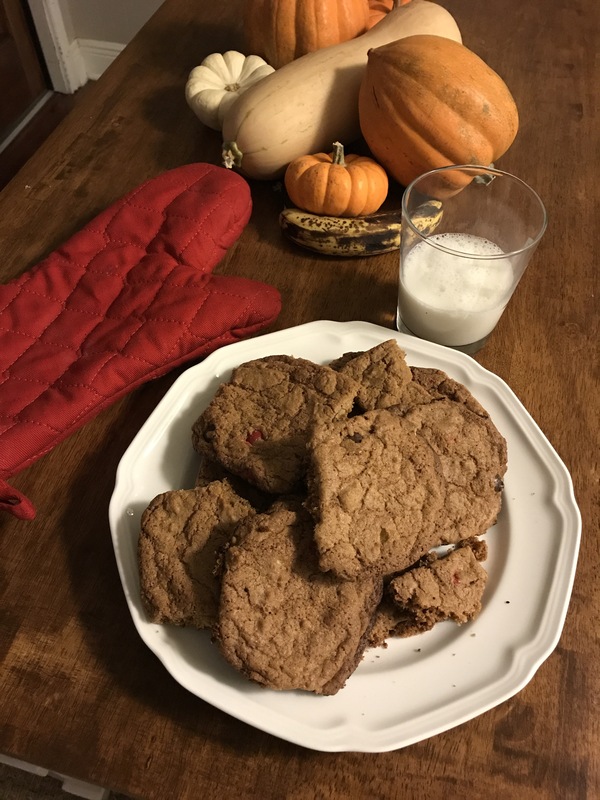 The cookies were a little burnt and not really circular, but that didn’t matter – they were made with love. It was really only just 30 or 40 minutes of time, but we now have a wonderful memory! At a marriage class recently, we were told to make sure we are really listening to our spouse. Not staring at your phone and saying “yeah” kind of listening – which I am guilty of… well, we all are at times I am sure! 3. Put yourself in your spouse’s shoes. This is such a great way for me to take a step back and remember that sometimes my feelings about a situation are often not quite an accurate picture of reality. (There, I said it.) If you put yourself in your spouse’s shoes, the new perspective removes some of the resentment and even hurt feelings. Seeing issues from another person’s perspective has always helped me in any relationship, whether it is a friendship or family! 4. Pray for one another. I know this one can be a little hard at first – we are still getting used to it! You may not be able to find the words or know what to pray. Even if it is just a few lines, say a prayer for your spouse. There is so much power in that which husbands and wives do not utilize! I just imagine God tapping his foot and waiting for us to reach out, but we are alone trying to solve it ourselves! A good simple prayer I heard once is to simply pray that your spouse be made to be more like Jesus. That covers SO much since Jesus is awesome in every way. There are also some great resources out there! For example, multiple people have recommended this book of prayers to me, but I haven’t had a chance to pick it up yet! I’d love to hear from you if you have other ideas for helpful prayer resources. 5. Keep a list of the ways God has been faithful in your life and in your marriage. Was your child sick and healed or diagnosed properly and treated? Or did you worry how a bill was going to be paid, and suddenly something worked out at work or through some other means to pay it? Or did you survive a tumultuous year of straight CRAZY together? That’s God. Not just happenstance. Write down those moments the minute they happen before your mind tells you they are a coincidence or lets it slip from your marriage memory! Then when your marriage faces a problem in the future, you can reflect back on all of the times that God was faithful and know that he’ll be faithful again! He is the most important member of your marriage covenant after all – it isn’t just you two!